Read more about Protest against COP21 - Let's stop the pyro-firefighters! 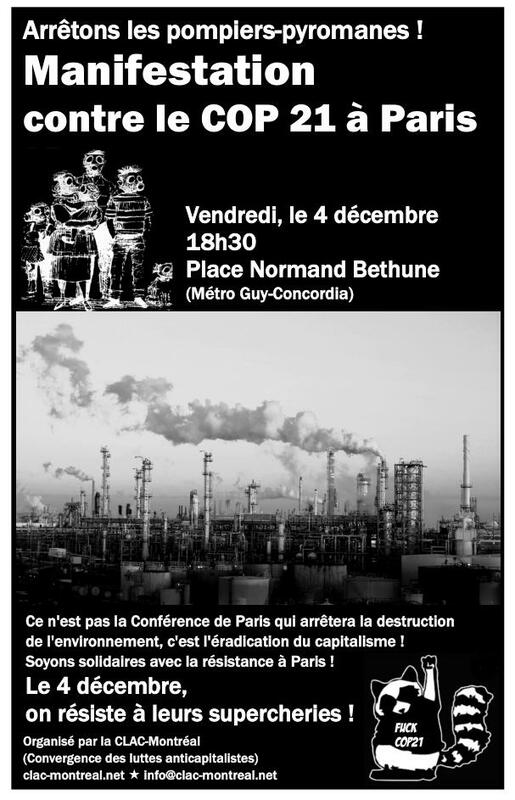 Read more about Manif contre COP21 - Arrêtons les pompiers-pyromanes ! Marche unitaire contre les déportations / bienvenue aux migrants ! 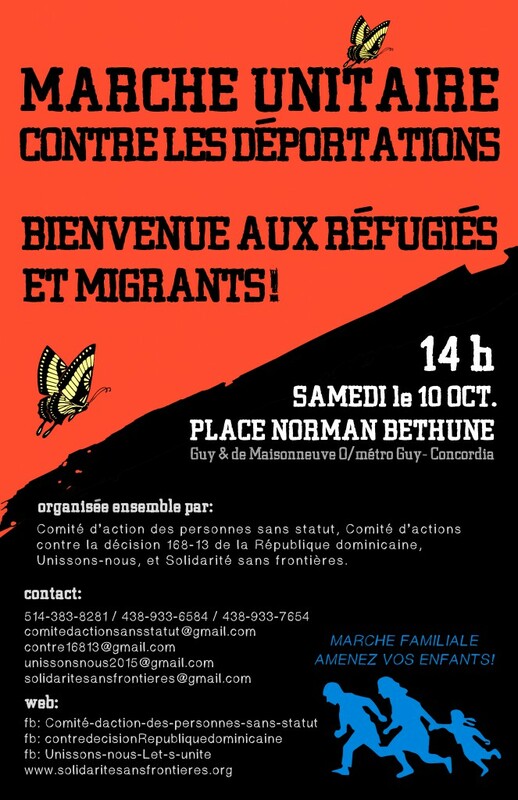 Read more about Marche unitaire contre les déportations / bienvenue aux migrants ! Lancement du nouveau journal de la CLAC ! Oyé ! Oyé ! Lancement du nouveau numéro du journal de la Clac-Montréal :Coup de torchon ! 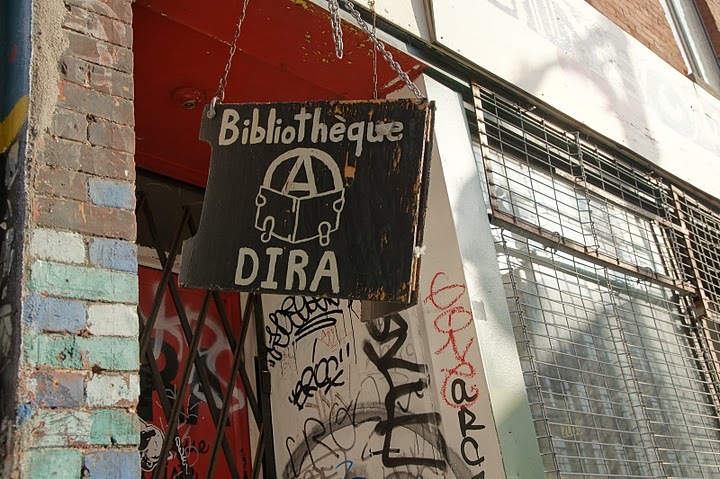 Le journal qui torche ! Coup de torchon |n. m. | loc. se battre, se quereller, se disputer, combattre. Read more about Lancement du nouveau journal de la CLAC ! The banks and big corporations have emerged from the economic crisis as winners. They continue to amass record profits! But, for the majority of the population, things are going differently. The crisis not only funnelled hundreds of billions of dollars of public money into "saving" the financial system, it served as a pretext for big businesses to carry out massive lay-offs and for governments world-wide to cut social services such as education and health. Capitalism only serves a handful of individuals. There have been endless corruption scandals and thefts of public funds. There have been tax cuts for the rich ... followed by cut-backs imposed on us. The greed of the rich is matched only by the enormous bonuses they lavish on themselves. It's ridiculous! Immigrants, the unemployed, people on social assistance, single mothers and the elderly are cruelly affected by the crisis of capitalism. But the so-called "middle" class is now also directly affected and the situation is only going to get worse: higher costs of living, lower salaries, reduced social protections, privatization, health care user-fees and more. We all contribute to the production of wealth. There is no valid reason for not sharing it fairly. There is absolutely no reason why this wealth should be stolen by a handful of billionaires, whether they be business leaders, war-lords, oil kings or dictators! Let's follow the example of the angry people of Tunisia, Egypt and Greece. Here, just like there, against capitalism, against all forms of oppression, for a better life, we have every reason to rise up! Let's rise up in the streets of Montreal on May 1st, International Workers' Day. Bring your flags and your scarves. Let's hit the streets!